Supported operating systems: Microsoft Windows 95, 98, Me, NT 4.0, 2000, XP, Server 2003, Vista, Server 2008, Seven, both the x86 and x64 versions are suitable for Actual Booster. Translations: English only. There are also obsolete releases translated into other than English languages: German, Russian, Ukrainian. Use this super slim Windows utility for speeding up your computer. It works by changing the priority of the currently active (foreground) application/program/game. It is a great trick for concentration of all system resources on the task you're working at the moment. The utility is completely standalone. It doesn't depend on the .NET framework, Java runtime, or other 3rd-party packages. 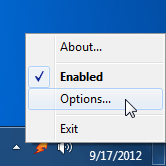 An icon in the taskbar's status area, which lets you control various program settings. 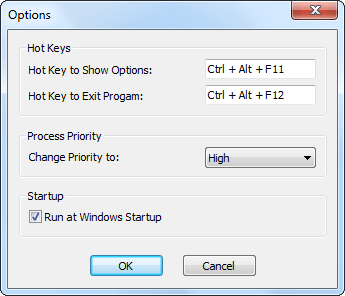 You can set hot keys for showing the dialog "Options" and for exiting the program. You can select the priority level (all possible values from minimal to the maximum). Automatically loading each time Windows starts. The modest memory and disk space usage. There is a portable ZIP edition available. The program is purely free of charge! 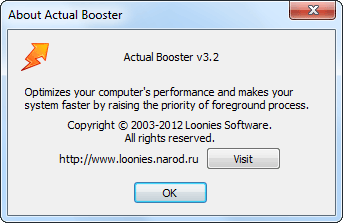 You can download and use Actual Booster at no cost since it is a true freeware product. We guarantee, that the program does not contain any form of adware or malware, including toolbars, spyware, viruses, trojans, and backdoors. We advise you to use the ExifCleaner Windows utility to erase Exif data completely, or if you need to remove individual Exif tags. Confirmed compatibility with the release preview of Windows 8. Recorded a screencast to demonstrate how to install and use the utility. Full support for Windows Vista and Seven. Changed the main font to Tahoma. New screen shots taken on Windows 7. Improved the installer of the booster. The older change log is unavailable.